The 60" x 49" Pioneer Platform with Vortex RCH System is a perfect solution for those not wanting to add a bulky rack to their Grand Cherokee WK2. 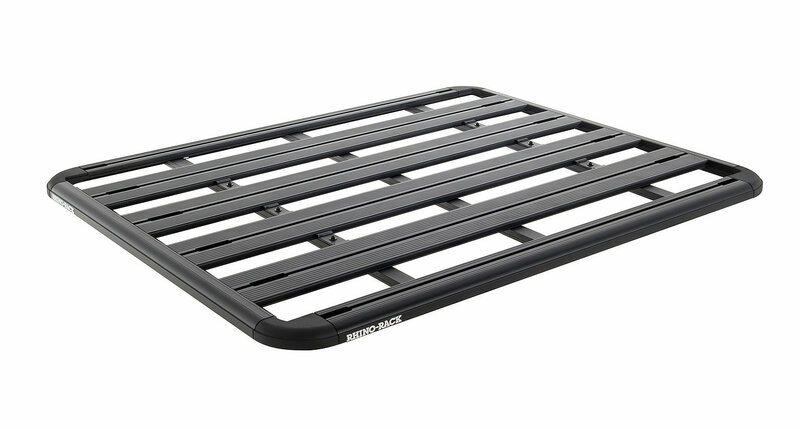 With no side rails this sleek rack makes loading and unloading cargo easy. The aerodynamic shape will help cut down on wind drag as you head down the highways or on the trails and the high quality aluminum will give you the strength and durability to keep your rack looking clean for years to come. Design: With no rails this rack allows your cargo to slide on or off easily and without hassle. The low profile aerodynamic design we help eliminate those annoying sounds you get from other racks on the market that are cause by wind drag. Maximum capacity is achieved by using strong and durable materials. Construction: Made from durable and lightweight reinforced nylon and aluminum for ultimate strength and protection from corrosion. Rhino Rack has made sure to put their racks through extreme conditions with them coming out looking as good as the first day they were installed. Installation: These racks come unassembled to cut down on shipping costs & you will need to make modifications to your Grand Cherokee such as cutting and removing sections from the plastic rails. 1. Cutting will be required.